Beer, it seems, is no longer what’s for dinner. As you can see, there has generally not been much of a relationship between alcohol purchases and changes in GDP — the correlation is essentially zero. Nor have alcohol purchases historically been any kind of lagging or leading indicator. But something was very, very different in the fourth quarter of 2008. Sales of alcohol for off-premises consumption were down by 9.3 percent from the previous quarter, according to the Commerce Department. This is absolutely unprecedented: the largest previous drop had been just 3.7 percent, between the third and fourth quarters of 1991. Beer accounts for almost all of the decrease, with revenues off by almost 14 percent. Wine and spirits were much more stable, with sales volumes declining by 1.6 percent and 0.9 percent respectively. Now, there are several plausible explanations for this. 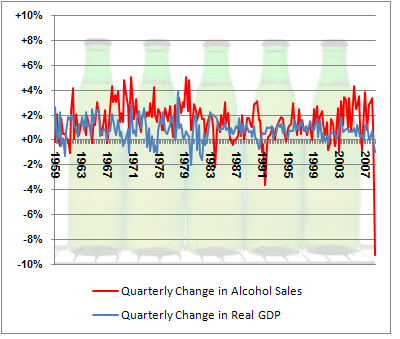 Alcohol sales — but particularly beer — had been on something of a hot streak prior to the 4Q, so perhaps there was some reversion to the mean. Perhaps people are substituting Michelob and Coors for more expensive microbrews like Alpha King and Dogfish Head. (This is unpatriotic, by the way, since all the macrobrews are now owned by foreign-based multinational conglomerates. Stimulate your country — and your tastebuds!). Perhaps retailers are discounting their prices, or brewers are passing along cost savings to their consumers (there had been a hops shortage for much of 2007-08). All of these are probably factors to some extent or another. Nevertheless, it’s absolutely startling to see a major consumer staple experience a sales decline like this. It’s not just beer, either. Sales of jewelry and watches were off by 7.2 percent in the fourth quarter, the third-largest drop ever recorded. Casino gambling receipts are down about 8.5 percent from a year ago, far and away the largest decrease ever over four consecutive quarters. What’s doing well? The movies. The movies, also historically a recession-proof industry but not a counter-cyclical one, are doing terrifically well. Motion picture theaters increased their revenues by 10.9 percent in the fourth quarter, according to the Commerce Department. But the movies are not typically seen as extravagant. You don’t feel guilty after purchasing a movie ticket; you feel kind of wholesome. I can’t escape the feeling that there’s something rather Weberian about it all: a manifestation of Calvinist guilt over both the present failures of the economy and its prior excesses. A deliberate effort to deny oneself pleasure.